I always think, “How can I explain this so that my brother David will understand.” Don't get me wrong, David is extremely bright. I consider David in that group of Americans who do not listen to talk radio, watch Foxnews or follow politics closely. David works hard, coaches children's football and raises his family. David's political news consists of catching sound bites here and there from the liberal mainstream media. People like David are being “played” by Jesse Jackson and his ilk. 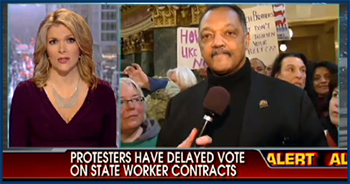 Jackson's latest despicable attempt to “play” the American people happened during a Foxnews interview in Wisconsin. His comments regarding Gov. Walker, the Republicans and the protesters were filled with absurd cliches and lies. Whenever Jackson opens his mouth, regardless of the facts or the situation, Jackson paints images of poor people suffering, children suffering and people being disenfranchised. It's the 1950s civil rights struggle all over again. Frustratingly, Jackson's “same old song” will work. His liberal media buddies will ignore the facts and distribute Jackson's fraudulent deceptive remarks unchallenged. My brother David will consume the tainted news. Injustice and bad guys “gettin' over” bugs me. Americans who are mildly paying attention to politics are being “played” by Jesse Jackson, the democrats and the liberal media. Appalling. On CNN, I called NAACP, chairman Ben Jealous a liar for saying he saw signs reading “Lynch Barack Obama and Eric Holder” at tea parties. If such signs existed, the liberal media would have made sure the signs went viral. No one has seen these signs except Jealous. Thus, the man is a disgusting racial hate inciting liar. Even The Prince of Peace and Love called out evil, “You serpents, you generation of vipers, how can you escape the damnation of hell?” Wow! Folks, that is a pretty strong rebuke. I don't think such a statement would pass the liberal media and democrat's civility test. In his Foxnews interview from Wisconsin, Jackson “played” good natured Americans like my brother David by tugging at their heart strings with lies. In a nutshell, Jackson's rant was HOGWASH! Jackson was “playin” my brother David and all of the hard working decent Americans who are busy earning a living, raising their families and are not really paying attention. Totally disgusting. The man has no shame. As Vice Chair of The Campaign to Defeat Obama in 2012, I sincerely covet your support. We are gathering “One Million People To Defeat Barack Obama 2012.” Please join us!